Several months ago, me and several friends had the pleasure of getting invited to an intimate gathering at the home of a British diplomat to meet Viv Anderson. He is a former player of the English football team and popular teams such as Manchester United and Arsenal in the 70’s-80’s. Also on the guest list were some of the members of the now famous Azkals - James and Phil Younghusband and their new coach - Simon McMenemy. We arrived at the venue a bit nervous and famished. It was a weird mixture of feelings. I'm not into parties where I don't know most people so I had some apprehensions. I was also very hungry and all I could think about was food. Unfortunately, when we got in, we saw no dinner tables, just one table that served as an open bar. Arrgh, it was one of those cocktail events! We were immediately offered drinks which I refused for a few seconds but since there wasn’t much to do and I could not see the waiters circling with trays of food, we approached the bar for drinks. Me and my other friend settled for red wine while the others had lime juice. Lus, our new fave bud with his eagle eye spotted the beer. The waiter filled my glass to the brim. Before I realized what I had done, I noticed that my glass was almost empty. I then began to feel a bit woozy. Suddenly, a waiter emerged from the kitchen carrying loads of spring rolls. I immediately grabbed one but the damage has been done. I was feeling light headed , sleepy and my cheeks felt warm. I can’t believe I got drunk in an instant. Viv Anderson made a short speech and afterwards, we went to him and introduced ourselves. His handshake is pretty strong. He is also very personable. Our other friends from the Beach football community chatted with him for a few minutes then we went around again, chatting and eating the canapés which were served by the staff who were all Pinoy. That evening, our crowd were the only Filipinos there and I guess the staff were glad that they had someone to talk to in our native tongue. They’re excellent and made sure we had plenty of food to eat. Hehe! The gathering wasn't as intimidating as I thought it would be. It was a relaxed crowd with lots of people talking animatedly. It also seemed that everyone knew each other. For once, I was glad that there weren’t a lot of photographers. I dunno if it was just me but I felt at home. Maybe it was because the affair is football-related. 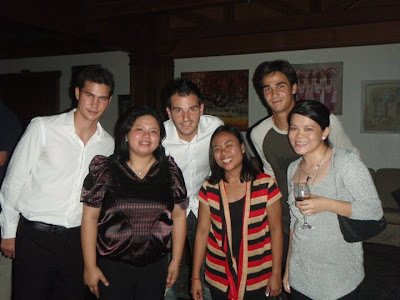 I also had the pleasure of chatting with the new coach for the Philippine football team - Simon McMenemy and – uhm, Phil and James Younghusband. Oh my gosh. Enuf said. We chatted about travel and I ended up giving them my card. They were quite down to earth and easy to talk to- not at all cocky like some athletes are. Thank you red wine for giving me a confidence boost, that I didn't get tongue-tied talking to these amazing athletes. After chatting with them, we said goodbye to them and Phil gave me and my friend a sisterly peck on the cheek which totally made my year. We left the gathering and headed off to Pier One for some serious munching and a lotta talking with booze. We finished the following day. Hehe! It was definitely one great evening!